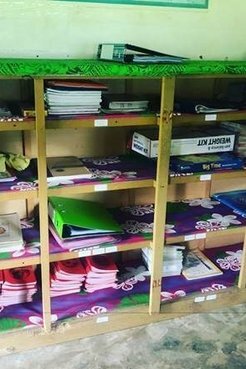 PCV Vanna K is currently serving at a school in South Santo. This year at her school, she began transforming an unused space into a resource room. 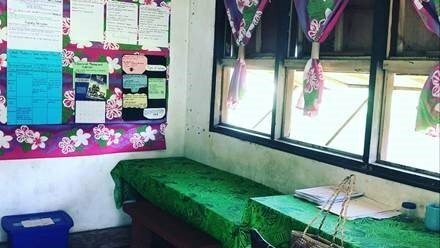 The room was transformed into one that could be used for storing all different types of resources, as well as provide a place for teachers to prepare for lessons. She created posters on how to use the room, what types of resources were tucked away in all the different shelves, what an ideal lesson plan looked like, ways to incorporate reading at home, as well as how to approach teaching different learning styles. It was great finding all these amazing resources her school already had but didn't know about. She found science posters and workbooks, leveled reading books, reading books for our French teacher (who at the time had NO resources), as well as different games for subjects like math. The best thing is that the teachers have really embraced it and owned its existence. They are constantly in the room signing out resources or reading different guides. PCV Vanna K, the principal, and school teachers with the local pastor after the room's dedication. She found it to be very helpful for the community teachers or some of the struggling government teachers. They are hungry for the information to improve what they are able to deliver to their students and this room allows them to study on these areas without having to be embarrassed by asking other teachers, even though often times discussions on how others have used the material in their classes occur. The school recently hired a librarian who is willing to be trained to run both the library and resource room. 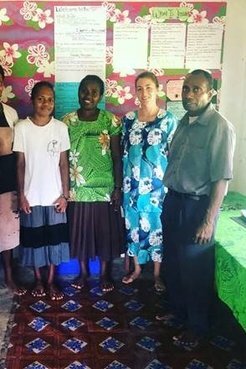 Vanna’s hope is that after her service is over, this woman will be able to assist the teachers in the assessments, pull out groups, and finding relevant resources for the teachers.